At 2,000 feet, the journey offered no chance for a granular diagnosis, but the big picture was clear: Southwest Florida and its huge population of retirees emerged relatively unscathed. ABOVE THE FLORIDA KEYS — The Conch Republic is still here, if dark, dirty, trashed, and weeks away from being what it was before Hurricane Irma blew in. It wasn’t devastated because, for some reason, this massive storm punched below its weight. This was a Category 4 hurricane on the Saffir-Simpson wind scale as it rolled into the Keys. It brought a fair bit of destruction, and tossed boats onto lawns. It turned towns raggedy. But a tour of Southwest Florida and the Florida Keys on Monday afternoon by air suggests that this quirky storm spared the state the kind of direct, punishing violence that residents had dreaded. A Coast Guard C-130 transport plane carrying two U.S. senators, a congressman, and a handful of journalists, took a two-hour tour of Hurricane Irma damage in Southwest Florida and the Florida Keys on Monday afternoon, leaving from the Coast Guard air station in Opa-Locka, just north of Miami. At 2,000 feet, the journey offered no chance for a granular diagnosis, but the big picture was clear: Southwest Florida and its huge population of retirees emerged relatively unscathed. The storm severely battered some of the small and fragile Keys. Key West itself is generally intact, though without power, a water supply, and a functional sewage system. The first part of the flight took the plane across the stippled landscape of the Everglades, where there is nothing to blow over and flood is the natural order of things. Then the boomtown retirement community of Fort Myers came into view. Then Captiva and Sanibel, the barrier islands. All looked generally fine, although some neighborhoods clearly still had standing, brown water covering the streets. Coast Guard Adm. Peter Brown pointed toward a golf course that had been badly flooded — too many water hazards for the golfers at this point. The Gulf of Mexico looked like churning mud water. Inland canals and waterways were oddly dark, bordering on inky. But it wasn’t overall a scene of destruction. “This is the result of the new building codes, which is a lesson we learned from Hurricane Andrew,” said the senior U.S. Senator from Florida, Bill Nelson. He noted that there were a smattering of cars driving on unflooded streets far below. Many palm trees had been stripped of their fronds, as if given military haircuts. He was flanked by Sen. Marco Rubio and U.S. Rep. Carlos Curbelo, who represents the Keys. Curbelo said that so far there’s been bipartisan support in Congress for storm relief for Texas and Florida after hurricanes Harvey and Irma. “So far, so good,” he said. But Nelson said, referring to emergency funding, “$15 billion for Texas and Florida will only get us to mid-October.” Rubio said local governments are going to be strained and will need assistance. Rubio said he thought the decision by Florida Gov. Rick Scott to order millions of people to evacuate South Florida well in advance of Irma’s landfall was the right one. He brushed off any suggestion that officials had been overly alarmist in describing Irma. The plane flew across the murky waters of Florida Bay, and Marathon Key came into view. It showed more property damage. 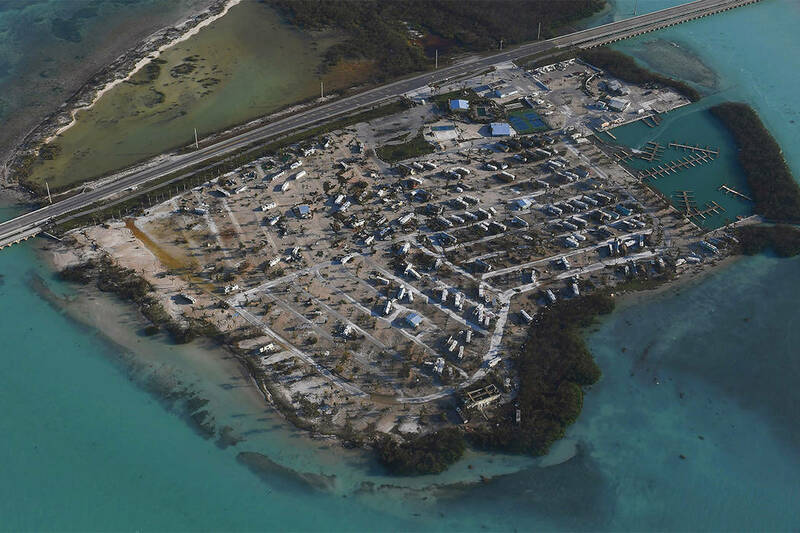 The plane turned to the Lower Keys, and now the scene was more like what you’d expect from a hurricane: Houses exploded, debris everywhere, boats tossed around, mobile homes on their sides. The plane set down on Boca Chica, at the Naval Air Station. A tour by 14-seater van commenced, with Capt. Bobby Baker of the Navy at the wheel and Coast Guard Capt. Jeffrey Janszen, sitting in back, narrating while driving around the military facilities on and around Key West. Janszen rode out the storm in Key West, at the Marriott Beachfront. He said all his people have been accounted for. In town, about 4,000 of Key West’s citizens stayed in town despite a mandatory evacuation order. And there is no getting back in yet. Roadblocks have been set up to prevent vehicle traffic from the mainland onto the Overseas Highway. Word spread late Monday that the road would be opened early Tuesday for residents and business owners. There are 42 bridges between Key Largo and Key West, Janszen said, and they need to be inspected. Conditions in the Lower Keys are raw and primitive without power, water, and fuel supplies. The port is closed pending an assessment of the shipping channel, including a search for sunken objects. The tour ended amid fading light as the van raced back to the airfield to beat the darkness, barely, for the return to Miami. And what a sunset, by the way. Still undamaged.